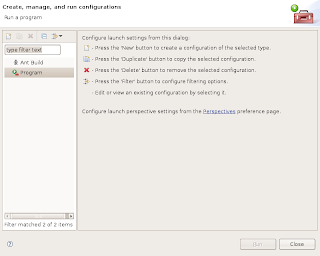 If you don't already have Eclipse installed in your system you can get it and the installation instructions from http://www.eclipse.org. Once it is installed, open it and go to [File tab --> New --> Project]. You will be prompted to select a resource, select [General --> Project]. In our example we'll use 'demo' as name of the project. If you don't see the screen below, you may want to enable the navigator view. 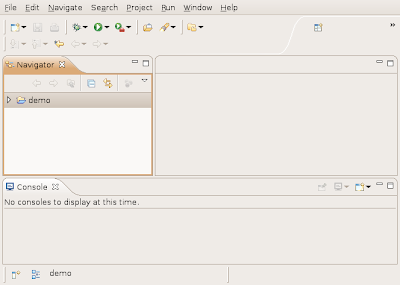 To do so, go to the Window tab --> ShowView and look for the 'Navigator' and 'Console' views. 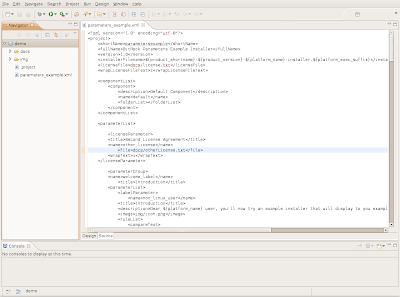 To demonstrate the integration, we'll build one of the demo installers that are bundled in InstallBuilder. Let's use the example for the parameter screens. 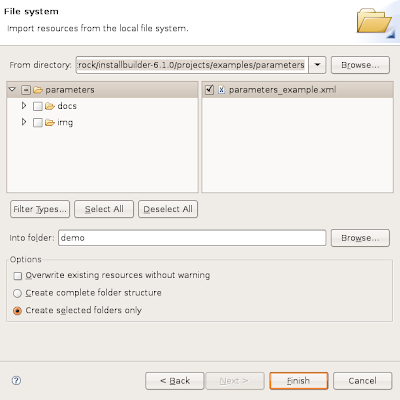 Import the project file parameters_example.xml that you can find in <installbuilder-installation-directory>/projects/examples/parameters. 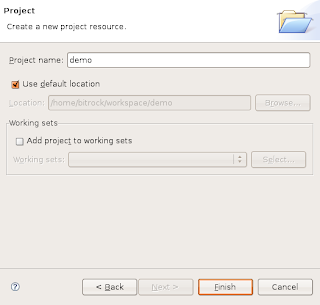 To import a file in Eclipse, right-click on the project name and select [Import]. 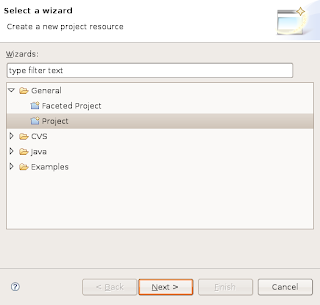 Then select [General --> File System] in the window that appears and navigate through your file system to select the XML project file, docs and img folders. As you can see, the source of InstallBuilder is an XML file. 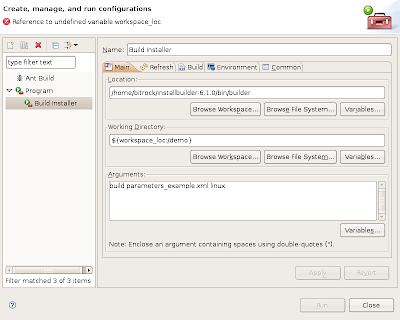 Now we are going to configure InstallBuilder as an External Tool. Go to [Run tab --> External Tools --> External Tools Configuration]. Now in [Run tab --> External Tools] you should have the [Build Installer] option. You can now test your installer. In the same way you added InstallBuilder as an External Tool, you can add the generated installer and launch it. 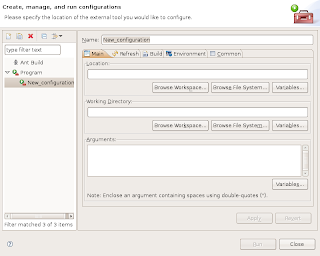 Below, you can see the configuration for the new External Tool. Remember to add it to your Favorites to make it easier to access. Give it a try! 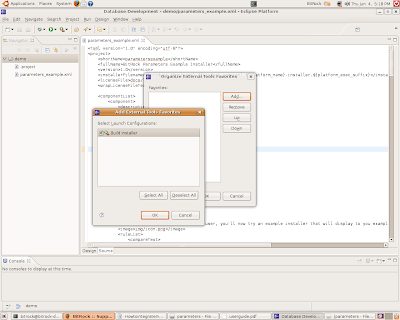 You will see your installer being launched from Eclipse. Before we wrap up, you know that InstallBuilder is a cross-platform installer, right? And that you can build installers for different platforms without the need to switch your development environment? 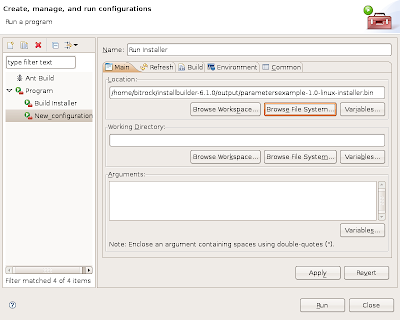 Yes, you can build installers for Linux, OS X and Windows all from a Linux machine. If you have your development environment on Linux and you have 'wine' installed, you will also able to test your Windows installer from your development environment.